The all-new models of Samsung & Huawei are here and they have a right to sturdy and reliable protection. Smartphone case Mitch is ready for this mission! Our newest backpack is more than just a rolltop. Side access, thick back padding, reflector strips, beverage holder, expandable capacity and much more. Its volume is variable, but the style is unmistakable. Find your new favorite bag for the city. Fred by Feuerwear is the wallet made from fire hose with removable card slots for your everyday use. Pager case Roger is made for all you heroes. It's the perfect accessory for every true fire fighter. We produce one-of-a-kind products from fire hose that have saved lives for many years, while withstanding heat and fire. Get unique Mitch protection for your new Samsung Galaxy S10, S10+ or Huawei P30. Samsung Galaxy S10 & Huawei P30 fits in Mitch 12, while Mitch 9 provides reliable protection for your Samsung Galaxy S10+. The recycled fire hose not only gives Mitch its unmistakable design but also stability and water repelling properties. Thanks to the convenient quick access tab, you always have your phone at hand. Every time you pull your phone out, the velvety microfiber lining automatically wipes it clean of dirt and fingerprints. The brand-new rolltop backpack Eddie with its flexible capacity is a game changer for your everyday life. Heading home to repack is a thing of the past. Eddie will accompany you on your day-to-day missions at the uni, the office or wherever you want to go afterwards – no repacking, no overstuffed backpack. One-of-a kind protection for your new iPhone Xs! Smartphone case Mitch – ahead of its time. The iPhone Xs and iPhone Xs Max will be available from 21 September and we already have the fitting cases. Our sturdy smartphone case Mitch is ready to protect your new smartphone from knocks and scratches. Its microfiber lining cleans annoying fingerprints off your screen every time you slide your smartphone into the case or when pulling it out. On 26 October Apple is releasing the brand-new iPhone Xr. Mitch 13, our new model in the series, will be available by 17 October to reliably protect your new precious smartphone. Shoulder bags, laptop bags, messenger bags and shoppers made out of fire hose. 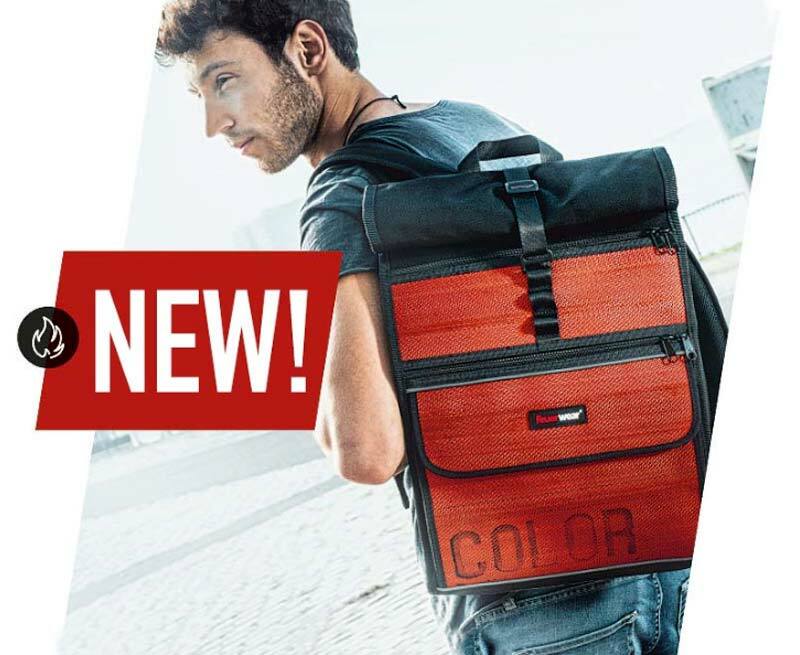 Backpacks with flexible storage space and comfortable padding made out of recycled fire hose. Wallets, belts, bags, writing cases and key chains made out of recycled ire hose. Mobile phone & tablet cases in various sizes made out of fire hose. Team player Harris is always ready to go and can keep up in any sport you can name. This gym bag comes with a mesh compartment, key finder, several zippered pockets, handles and removable shoulder strap make Harris your perfect training buddy. The special thing about it: the wet compartment protects your clothing and equipment from all traces of your workout. And Harris doesn’t just cut a fine figure at the track or gym – it also makes a great overnight bag. Hip bag Otis gives you free rein for your everyday missions. Phone, keys, wallet – all you need. Click! and go. Otis gives you free rein. The only hip bag made of recycled fire hose is now available in our shop. Hip bag Otis keeps your valuables close at hand, sturdy and water-repellant to keep your concert tickets safe. The first belt pouch made from used fire hose pays off whenever a backpack is too much. Attention lifesavers - pager case Roger has arrived! A new hero joined the Feuerwear-Shop: Pager Case Roger reports for duty in the truest sense of the word. Roger is made of sturdy recycled fire hose and protects your device from drops and scratches. Thanks to its broad belt loop and extra wide velcro fastener you can easily open and close Roger. Get your unique item now to assure uncompromising on-call duty. The unique men’s wallet Fred made of robust fire hose is your perfect companion for everyday use. We produce one-of-a-kind products from fire hose that has saved lives for many years, while withstanding heat and fire. this has left traces which make every product unique. For this reason we photograph every product individually for our online shop. Find your one-of-a-kind product now!